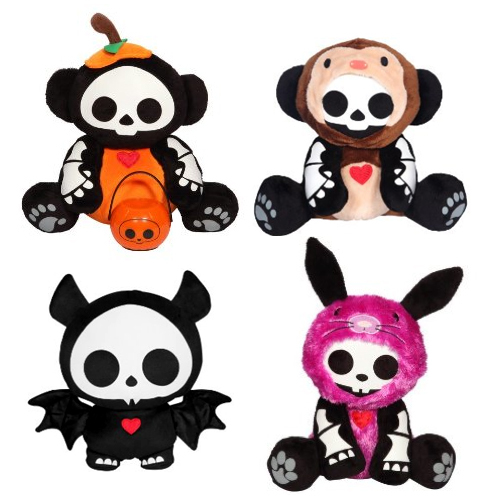 This year Target's Halloween theme is Skelanimals. They make me a little sad because they are described as "Adorable little animals who have met an untimely end-mostly due to their own reckless and ill-advised behavior." It's pretty hard to top last year's Domo Halloween at Target but the Skelanimals dressed in bunny and bear costumes are pretty funny. Our local target had NO FALL OR HALLOWEEN stuff out yet..i could NOT believe it...those are so cute too! I was looking for the Halloween shirt that you had bought from Target and my local store (in San Jose, CA) doesn't even have that out yet. Bummer.